The goal is clear: after its most successful season ever, Mercedes-AMG Customer Racing is aiming at wins in motorsport series all over the world in 2019 as well. The first ones are envisaged in January in two prestigious endurance racing classics. In the 24-hour race in Dubai from 10-12 January, the BLACK FALCON team will be competing as the previous year’s winners. 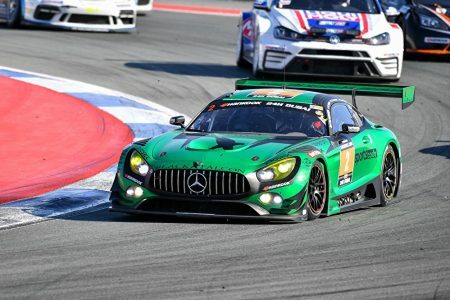 In the Daytona 24 Hours on 26-27 January, the Mercedes-AMG Team Riley Motorsports is starting the new IMSA WeatherTech SportsCar Championship season as the defending IMSA Michelin Endurance Cup champions. At the legendary Daytona circuit, Team TGM will be starting off the new year as the defending champions in the IMSA Michelin Pilot Challenge with the Mercedes-AMG GT4. Dubai / Daytona Beach – In the Dubai 24-hour race, Mercedes-AMG is aiming at its fifth victory in the desert metropolis. The BLACK FALCON team already secured the overall win for the performance and sports car brand from Affalterbach in the years 2012, 2013, 2015 and 2018. This year, the team is running the Mercedes-AMG GT3 with starting number 2 with last year’s race winners Abdulaziz Al Faisal (KSA), Hubert Haupt (GER) and Yelmer Buurman (NED), paired with their new teammate Saud Al Faisal (KSA). The sister car with starting number 3 that retired while on course for victory last year will have Khaled Al Qubaisi (KSA), Jeroen Bleekemolen (NED), Ben Keating (USA), Manuel Metzger (GER) and Luca Stolz (GER) as its drivers. Four additional Mercedes-AMG GT3s will be run by CP Racing, Hofor Racing, HTP Motorsport and MP Motorsport, among others with support from Mercedes-AMG Driver Bernd Schneider (GER). The field of 78 cars in Dubai includes six GT3 and four GT4 cars from Affalterbach. The race starts on Friday, 11 January at 15.00 hrs local time (12.00 hrs CET). Traditionally, the IMSA WeatherTech SportsCar Championship season gets underway with the 24-hour highlight at Daytona. Last weekend (4-6 January) already, the Mercedes-AMG GT3 and GT4 teams participated in the “Roar Before the Rolex 24” at Daytona International Speedway. In the major three-day test prior to the classic endurance race, the teams racked up numerous laps and refined their set-ups at the 5.7 kilometres long track. For Mercedes-AMG, the Mercedes-AMG Team Riley Motorsports will be racing as the defending IMSA Michelin Endurance Cup champions in Florida. Ben Keating (USA), Felipe Fraga (BRA), Jeroen Bleekemolen (NED) and Luca Stolz (GER) will be alternating as the drivers at the legendary oval. Last year, the team with starting number 33 ended up fourth, only just missing out on a podium finish. With a good result, Riley Motorsports aims at lying the foundation for another title defence, the team already having won the Endurance Cup in 2017 and 2018. The P1 Motorsports team is running the second Mercedes-AMG GT3 at Daytona with Dominik Baumann (AUT), Maximilian Buhk (GER), “JC” Perez (COL) and Fabian Schiller (GER). The start of the Daytona 24 Hours is on Saturday, 26 January, at 12.35 hrs EST (18.35 hrs CET). On Friday, 25 January, the IMSA Michelin Pilot Challenge already starts its new season with a four-hour race at Daytona. The seven Mercedes-AMG GT4s again include winning Team TGM with starting number 46. Hugh Plumb and Owen Trinkler (both USA) will be racing as the reigning Grand Sport class champions for the team owned by Ted Giovanis (USA), who himself will be racing the team’s second Mercedes-AMG GT4 together with Guy Cosmo (USA).